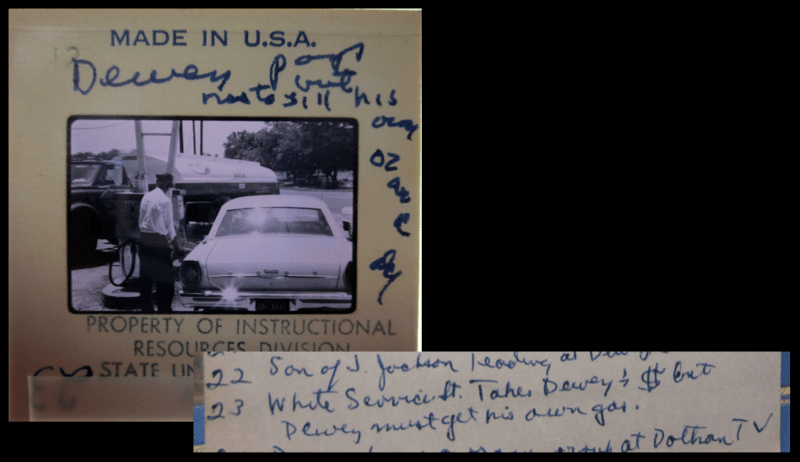 Black singer “Dewey [Williams] must get his own gas” at a service station outside Ozark, Alabama, June 1968. Photograph and notes by William H. Tallmadge. Courtesy of Berea Sound Archives. On Thursday I gave a talk at Berea College’s Appalachian Sound Archives about the research I’ve conducted as a Sound Archives Fellow. My talk, “Race, Place, and Tunebook Revision: Researching Sacred Harp’s Twentieth Century Transformations as a Berea Appalachian Sounds Archives Fellow,” drew on my work with materials in the sound archives documenting black Sacred Harp singing in southeastern Alabama in the late 1960s and oral history interviews I’ve conducted as a fellow with members of families with long histories of participation in Sacred Harp singing from Georgia, Alabama, Mississippi, and Texas. My talk drew on examples from both sets of material to describe how folklorists’ aesthetic and economic/occupational priorities often differed from those of their subjects. The talk was well attended by a crowd of Berea College faculty and students as well as local Sacred Harp singers. I was particularly delighted to meet friends and colleagues of William H. Tallmadge (1916–2004), the music scholar whose field recordings and interviews with black Sacred Harp singers in 1968 I was discussing. Many thanks to Harry Rice, John Bondurant, and the staff of the Sound Archives for their help during my time as a fellow and for their work promoting the talk.